I really can’t put my finger on where I first came across Frank Sidebottom, logic would dictate that I’d have spied him on one of his regular appearances on Number 73 but there aren’t any memories I can dredge up. I know I watched it every so often, but apart from the theme tune there’s nothing on any cortex I can connect to, maybe the ungodly presence of both Sandi Toksvig and Neil Buchanan has led to a form of repressed memory syndrome. I guess it may have been one of the famous (how many other TV guest spots have songs written about them?) Match of the Day episodes — both when Altrincham were doing “well in the F.A. Cup” — or perhaps it was when he was booted from The James Whale Show, I used to watch all sorts of crap. Getting the Spanish archer from what was such a disorganised show was an achievement that later touring partner Charlie Chuck never managed, proof perhaps of an anarchy of spirit belied by the colouring pens and deference to his elders. 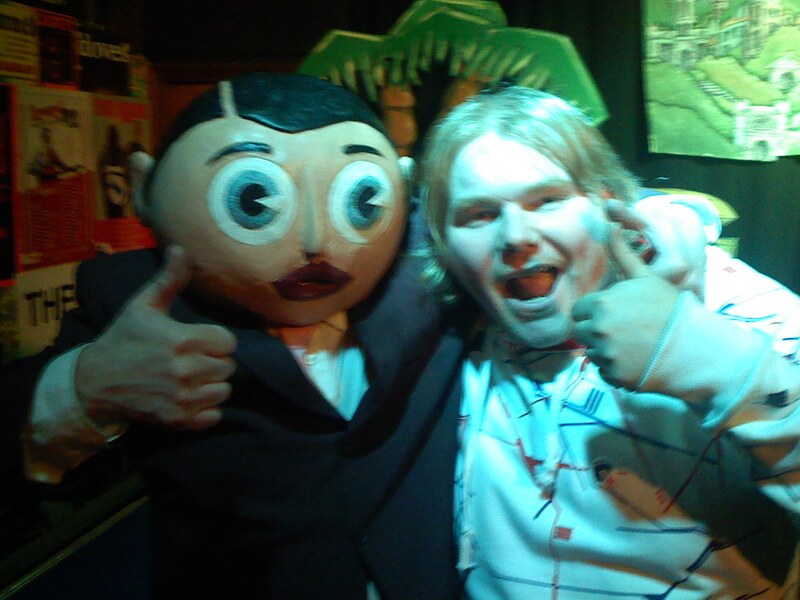 I don’t remember the first time I saw or heard Frank Sidebottom, it’s sort of like he’s always existed. But I do remember the first time I met him, or Chris Sievey to be pedantic. The Reading Festival has always been the strangest mainstream gig in the British summer calendar, a three-day festival where the rock hangover meant that it was completely possible to go and find yourself after two days of indie’s finest suddenly confronted with a sea of plaid shirts and not a single discernible tune. So that’s the reason I was in the comedy tent that Sunday evening in 1995 and instead of seeing Neil Young muscularly backed by a lumpen Pearl Jam, was shouting “spiders!” in an attempt to put off the apparently arachnophobic singer. Frank was leading that, and I was as smitten as one man can be with another who has a perfectly spherical fake head. 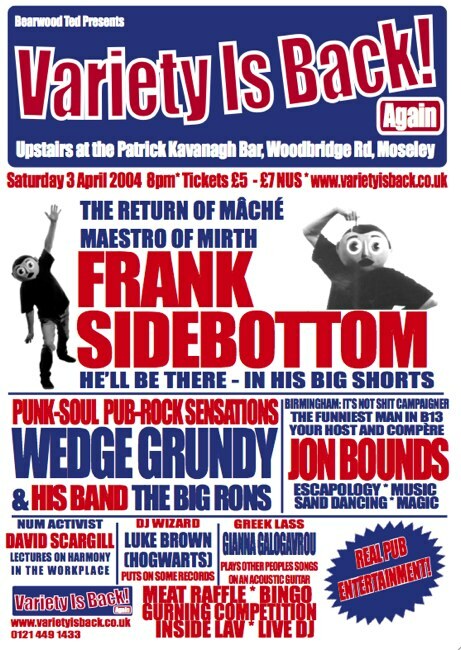 So that was why, almost ten years later I’d bullied — apparently — the man out of semi-retirement to play a hugely shambolic gig upstairs in a pub in Moseley. We, mate Gavin and I, were intent on “bringing back Variety” and after one, equally shambolic but way less good, night (band, comedian, raffle, bingo essentially) we’d decided that the only act that could top it was Timperley’s finest. I’d stumbled on a fantastic set of arty pictures of Frank online and established a route in via the photographer. So, after a gushing phone call in which the subject of money was only lightly touched upon, Chris reckoned that Frank would be able to make it, that he was looking to get back into showbiz, and that £250 and a cut of the door was plenty. As I drove him to the venue he talked non-stop: about other gigs he’d done in Birmingham, asking after Dave Travis, about Tony Wilson and the Channel Four show Remote Control. There was one anecdote about how he’d made an African tribesman Frank and it hadn’t gone down well with the director, it was brilliant stuff that I couldn’t do justice even if I could remember it. The show was the most disorganised I ever saw Frank perform, crawling along the floor pushing his suitcase, interrupting my weak-assed comedy turn as a camp NUM shop-steward (don’t ask), going off after a couple of songs so as to encore all night — fantastic. 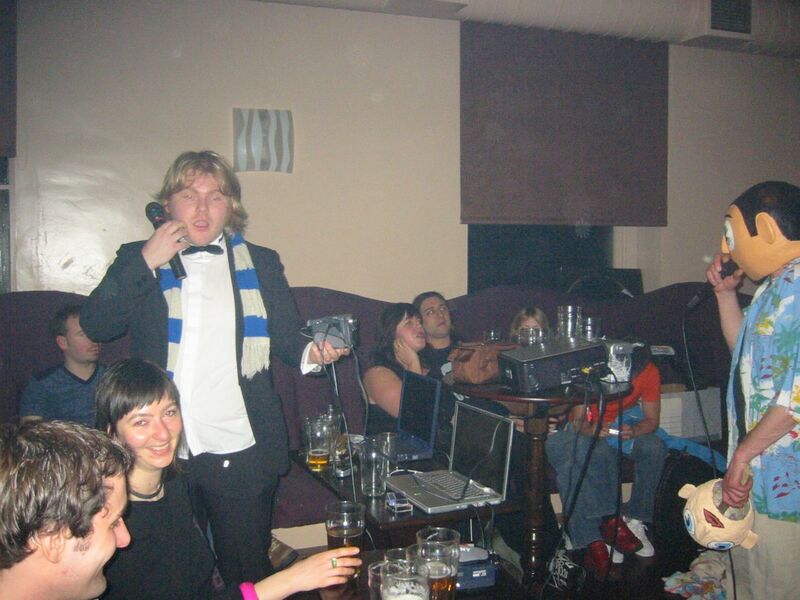 He even pinched my backing band Wedge Grundy and the Big Rons for a medley of hits where they didn’t know the chords. That was okay though, because Frank didn’t know the words and it became the funniest jazz-funk work-out I’ve ever seen — as well as the only one I’ve ever watched all the way through. Frank was out of practice, not unprofessional, although Chris had definitely had a good drink. We had too, the night was wet with booze, and I even — whisper it — got to try the head on, it didn’t fit. At this stage I hope it doesn’t break any illusions to tell you that without the head it was Chris, with it, Frank. Supremely method, but there was one other piece of preparation — Chris would wind electrical tape around his nose, presumably to get the nasal voice just right. I didn’t have the heart to mention that it made almost no difference to pitch or rhythm. After the gig we went to the curry house over the road, where Chris held court. He ordered twenty-seven poppadoms, as the World Record was “twenty-six actually” — he’d apparently eaten twenty-five in an restaurant before where he was told of the record: “I could have eaten two more but… I couldn’t be arsed”. He then picked up the tab for the whole crew, costing almost all of his fee I’m sure. But the best Chris moment didn’t come then, nor the next day when he regaled us with tales of Manchester City which drinking shandies made with coke instead of lemonade, nor even when clinking with bottles of Bacardi Breezer he climbed into the back seat of Cookie, our bassist’s wreck of an MG for a lift back to Timperley and promptly fell right asleep. No, the story that I’m proud to tell most happened back at Woody (née-Wedge)’s flat where there was nothing but Prince’s Purple Rain that would satisfy him — it was played many time that night, and the following morning too when Chris discovered that he needn’t have slept sitting on a stool in the kitchen “oh you do have other rooms then”. I only met Chris that once although we talked on the phone and over email a bit, most recently to arrange a slot for him on my radio show. But when I heard of the cancer I was upset, and upon hearing the news yesterday I felt an hollowness that I can only match with deaths of people I’ve known and really cared about, so I think I was touched. I saw Frank quite a bit though, each time at a bigger and better organised gig: Little Civic, Jug of Ale, Wulfrun Hall and on Manchester’s Channel M and heard him in recent months on Manchester Radio Online. He’d finally got that second Greatest Hits compilation out, the marvellous E,F, G. & H, and seemed to be heading back to something like his peak. In truth he was rediscovering an old audience, one with more opportunity to enjoy him and more money to pay, rather than developing a huge new one — but it was growing again and he was playing regularly again. More importantly he was creating again, I’ve been searching iTunes over and over these last weeks waiting for Three Shirts On My Line (his World Cup anthem) to go live for download. At the moment it hasn’t yet, but there are Internet People awaiting to propel it into the charts. Frank never got to do Guess Who’s Been On Top Of The Pops, although he outlasted the programme, and while the power of the number one has long since faded you can bet that Frank Sidebottom would have loved it. He was pop all the way through. A giant of light entertainment, and a man I’m proud to have spent time with. You know I am, I really am. This entry was written by Jon Bounds, posted on 22 June 2010 at 1:27 am, filed under music, writing and tagged Frank Sidebottom, gavin wray, Jug of Ale, me, Moseley, Reading Festival, variety is back. Bookmark the permalink. Follow any comments here with the RSS feed for this post. Post a comment or leave a trackback: Trackback URL.